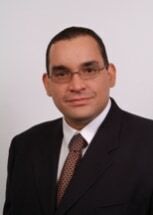 Angel Berberena is a Capital Member of the Firm and Member of the Labor and Employment Law Department. His practice involves active litigation and advising employers and management in all areas of employment law and personnel practices including sexual harassment, discrimination, retaliation, privacy, wrongful termination, wage and hour, leaves of absence, reductions in force, reorganizations and closings. Mr. Berberena defends employers in litigation before local and federal administrative, judicial (including appellate level) and arbitration forums. Mr. Berberena regularly lectures on labor and employment topics and provides training for management.